All materials expand and contract with temperature to some extent. Most materials expand in rising temperatures, while a few shrink. Most materials shrink in falling temperatures, while a few expand. Most materials expand and contract uniformly in all directions, but some materials such as graphite composites, wood and optical crystals expand and contract differently in different directions, termed anisotropy. The degree of dimensional change with temperature can vary widely among both glasses and metals, and can itself vary with temperature. Average CTE values for various metals typically used in telescope construction are shown in Table 1. Values for some materials given in Table 1 can change significantly with alloying composition and temperature range. Notice that although Invar 36 is slightly more expansive than Super Invar 32-5 at 20ºC (which is nearly zero at room temperature), Super Invar 32-5 expands considerably more at high temperatures. As seen in Table 1, the CTE for nearly all materials varies with temperature. Ideally, the temperature-conscious telescope designer has a polynomial f(T) available for the variation of CTE with temperature for each candidate material. Table 1. Coefficient of Thermal Expansion for various metals. A 6061 aluminum refractor tube is 2200 mm long at 20ºC. What is its length at 35ºC? This is more than enough to defocus an image, and the user must refocus. Nearly all optical glasses have a temperature dependent CTE as well, and this must be taken into account in thermal design of optics. Example values are shown in Table 2. Glass manufacturers provide detailed data sheets for all their glass products, which should contain CTE values over temperature (but don’t always). Table 2. Coefficient of Thermal Expansion for various optical glasses. The index of refraction of all optical glass changes over a spectral band, and always decreases with increasing wavelength within the transmission passband. This behavior is termed dispersion, and is the fundamental glass property used in optical design. However, index of refraction also changes over temperature as well as wavelength, complicating thermal optical design. Most indices increase slightly with rising temperature, yet some decrease. This change in refractive index with temperature is referred to as the thermo-optic coefficient, but more often simply termed “dn/dt” in glass catalogs. dn/dt is a nonlinear, highly glass-dependent function of both temperature and wavelength. The effect of dn/dt is to change the refractive power of each lens element, which in turn causes temperature-dependent changes in telescope focus, as well as changes in aberrations over the pupil, spectrum and field of view. Not all glass data sheets show dn/dt values over both wavelength and temperature. The wavelength and temperature dependence of dn/dt for BK7 is shown as an example in Table 3. The index of refraction of BK7 is seen to increase with both temperature and wavelength, but not in a linear fashion. Combined with thermal expansion, even these small index variations are enough to alter imagery in multi-element optical systems. The two thermal properties of metals and glass described here – CTE and dn/dt – must ideally be taken into account when designing a telescope. The term “athermalization” describes the designing of a lens (and overall instrument) to work well over a range of temperatures rather than just really well at one temperature. Athermalization design accounts for changes in glass, cell and barrel materials with temperature. A telescope optimized at only one temperature will likely change performance at other temperatures, and usually for the worse. Temperature changes can cause defocus, aberration changes, airspace shifts, component misalignment, and loose or pinched elements (and, severely pinched elements can warp and even fracture). A comprehensive, robust telescope design must be optimized over the ensemble of anticipated storage and operating temperatures. Most modern optical design programs account for both CTE and dn/dt during lens optimization, provided that correct data is provided to them in the glass library from the manufacturer’s data sheets. The free optical design program OSLO-EDU that is used extensively by ATM’s here on CloudyNights can model temperature effects, but not simultaneously across a range of temperatures. When air temperature changes, objects immersed in that air will begin to assume the same temperature as the air over time. Heat always flows “downhill” to colder (lower energy) regions of an object. It is helpful to think of heat flow in terms of water flowing downhill. An ice cube held in the palm feels cold and chills the skin because the ice provides a “downhill” contact area where higher-energy body heat can flow to a lower energy object. Heat energy flows out of the warm palm into the ice, cooling the skin and melting the ice. The speed at which an object’s temperature follows the air temperature depends on the object’s thermal conductivity, which is the rate of heat flow from hot to cold, expressed in watts/(meter-ºC). Metals have high thermal conductivity, while both glass and air have very low thermal conductivity. Glass thus acts as an insulator, as heat is not conducted well through it. Metals reach a uniform volumetric temperature, termed thermal equilibrium, much faster than glass, which can lag behind by several degrees in falling temperatures. The change in an object’s temperature, termed a thermal transient, does not instantly happen throughout the object’s volume, even for metals. These differences in temperature within a volume are termed thermal gradients. Reaching thermal equilibrium for an object immersed in a uniform temperature always takes a finite amount of time. The term adiabatic means that no heat is transferred across a material interface, which simplifies thermal analysis. However, the interface between a lens and its cell, and into the surrounding air, is not adiabatic, meaning that heat is transferred at the interfaces at some non-zero rate. Because lens cells and barrels are made from metal, heat flows out of the glass element to the metal cell more rapidly at the edges than at the center. The cell metal basically “sinks” heat out of the lens elements in falling temperatures. A cooling lens element thus has a higher core temperature than its surface or skin temperature, creating a thermal gradient across its volume. Falling temperature causes a greater thickness shrinkage at the surface of a lens element than at the core. Besides distorting the surface figure away from sphericity, this also introduces mechanical stress in the lens elements that can potentially cause mechanical and optical problems, and even stress fracturing if too high. Anyone who ever heated glass marbles in an oven, then dunked them in ice water, knows this phenomenon quite well. Birefringence is also introduced in stressed glass that alters the polarization state of transmitted light, but birefringence is beyond the scope of this article. The thermo-optic coefficient dn/dt of a glass follows localized glass temperature within the lens volume, and thus creates wavelength-dependent refractive index gradients in the lens that nonuniformly change optical power across the lens aperture. Index gradients can introduce defocus and additional aberrations in the lens imagery. These effects are usually transient, as volumetric temperature and index gradients in a lens element disappear as the glass thermally equilibrates. At equilibrium, the refractive index is homogeneous throughout the element, albeit at a slightly different value than it was at a previous temperature. Thermal transients are complex to calculate during lens design and are usually ignored. Transients require partial differential equation heat-flow solvers, and detailed knowledge of initial and boundary conditions, to calculate the volumetric temperature profiles in changing temperatures. This typically requires an enormous amount of computer memory and execution time to converge, and this iterative heat flow solution must be repeated numerous times during lens optimization. Transient optimization is important for systems used in space and high-powered lasers, for example, but is not necessary for smaller ground-based telescopes. Thermal transients are far too complex for most optical design codes, and modeling of lenses and barrels is simplified as already being at thermal equilibrium at some specified temperature. Thermal equilibrium has been achieved when heat flow in the system has diminished to a negligible level. The temperature of all lens and metal components has become uniform and homogeneous following a temperature change. In this case lenses simply scale in overall size according to temperature-dependent CTE and DT (change in temperature). Lens diameters, radii of curvature, center and edge thicknesses, and aspheric profiles all scale linearly relative to one another. Spherical lens surfaces remain spherical at any equilibrium temperature; their radii simply scale with temperature and CTE. Barrels and tubes also scale with temperature-dependent CTE and DT. However, glass index of refraction changes according to dn/dt, thus thermally equilibrated lenses change their refractive power with both CTE and dn/dt, recalling that dn/dt is also a function of wavelength. It is easy to see from this why temperature ranges should be accounted for when designing a lens system so that the best optical performance over the temperature range is achieved. Figure 1. Thermal Equilibrium modeling for a 100mm f/8 apochromat. The lenses grow or shrink with temperature relative to the entrance beam diameter. The metal used in a lens barrel most likely expands and contracts at different rates than the glass lens elements, each which likely have different expansion rates. Lenses will expand or contract in outside diameter and edge thickness depending on the glass CTE. If the barrel expansion coefficient is higher than the glass, falling temperatures cause the cell to compress down onto the lens elements, pinching the elements and causing strain, warping, astigmatism and possible fracture. If the same lens/barrel assembly equilibrates at higher temperatures, the barrel expands away from the glass, causing elements to be loose in the cell and possibly introducing misalignment and potential shock damage. It is therefore vital to pay attention to lens/barrel interaction over temperature. Lens outer diameters and barrel bore diameters must be as compatible as possible over temperature. Metals do exist that have CTE values very closely matching some glass, but a lens system may not be made from the same glasses, thus glass CTE values also vary significantly along the lens. It is not possible to match a lens barrel to a group of glasses having widely varying CTE, unless different metals are used for different elements, which greatly complicates lens cell manufacturing. 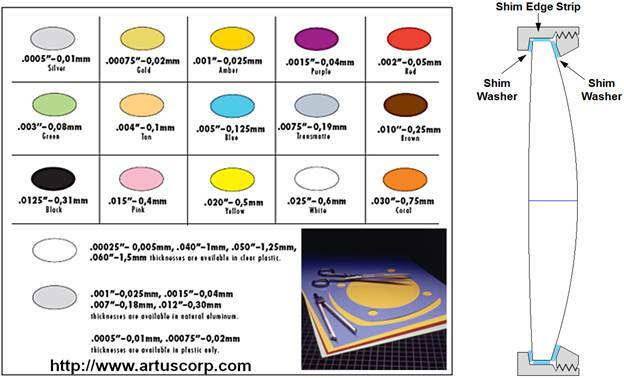 Figure 2 shows the Artus color coding format for their shim products. Also shown at right is a recommended method for shimming lens surfaces in a cell. Lens shims are the least difficult to work with if they are in the 125 µm to 310 µm thickness range. Shims thinner than 125 µm are easily damaged due to folding and creasing while trying to insert them, and shims thicker than around 300 µm are very difficult to cut with clean, burr-free edges. Selection of a barrel metal is usually biased toward aluminum due to cost and availability, and ease of machining and anodization. It actually isn’t the best choice for holding lenses securely in a cell over a temperature range, however, due to its high CTE relative to any optical glass. Referring back to Tables 1 and 2, steel alloys more closely match glass expansion, but are close to three times the density and weight of aluminum. Brass CTE is almost as high as aluminum. Titanium is ideal for lens cells but is expensive and hard to machine. Other exotic metals such as magnesium and beryllium are possible, but have safety issues (beryllium is extremely toxic and costly to machine). Given the variety of candidate metals for lens cells, and wide range of lens element diameters, it is very useful to generate a spreadsheet for specifying both the lens element outer diameters and barrel inner diameters for a set of chosen glasses over both the operational and storage temperature range. The key parameter to remember is to avoid radial compression of lens elements at the low and high ranges of temperature. The barrel ID should always allow for edge shimming to reduce compression and looseness. In the example spreadsheets shown in Figure 3, it is easy to see that though aluminum is economical, titanium is a better CTE match to glass. Figure 3. Spreadsheet for specifying lens OD’s and barrel ID’s. This article concludes with an example of incorporation of athermalization in the author’s optical design of a 100mm aperture, 800mm focal length apochromatic lens. The wavelength range is 0.40-0.78µm, wider than human photopic/scotopic visual responses and compatible with most CCD and DSLR focal plane array spectral bandwidths. The field diameter is 1.0º, and no field flattening lens is used. The operational and storage temperature range for the example lens is -20ºC to +50ºC, which is fairly extreme for visual observing and astrophotography. The tube is made from 6061 aluminum tubing having a CTE of 23.5 ppm/ºC. Glasses were only used that have complete dn/dt data. The final glasses used are Schott N-BaLF4, Ohara S-YGH51 and Hoya FCD10 glass. The prescription for this athermalized apochromat at 20ºC is shown in Figure 4, in Zemax format. 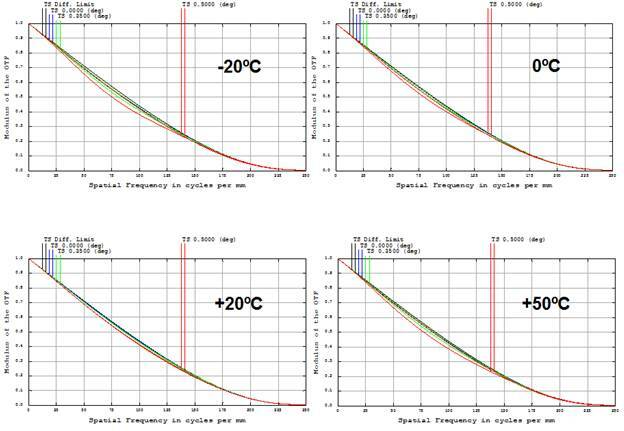 Thermal optimization consists of modeling the lens at several different temperatures in separate configurations, shown in Figure 5, and optimizing performance over the ensemble of temperatures. Configuration 1 is the nominal system at +20ºC. Variables for optimization are set at the nominal temperature in the Configuration 1 column. Configurations 2-8 vary the lens temperature, as seen in line 2 in Figure 5. Temperature-dependent parameters are changed using thermal pickups from each nominal parameter. Lens curvatures are shown in rows 4-9, center thicknesses are shown in rows 11-16, and changes in diameters with temperature appear in rows 18-23. Back focal length (BFL) is the distance from the last glass surface to the focal plane. BFL’s are modeled in line 16 using the THIC 6 operand, enclosed in the heavy red box. These thicknesses are allowed to individually optimize for best focus at each temperature, rather than being calculated as thermal pickups. The range in over temperature includes all lens effects as well as the barrel length. This models the extent of focuser travel needed. The lens layout and spot diagrams at best focus for 20ºC over the 0.40-0.78µm spectrum and 1º diameter field are shown in Figure 6. All energy in the white-light spots is well within the f/8 Airy disk at 0.555µm. The spot diagrams shown in Figure 7 show that with refocusing, the optical performance holds up well over the field of view for extreme observing temperature. Each spot is composite of 12 overlapping wavelengths from 0.40-0.78µm. All are at best white-light focus for each temperature, and the BFL at each temperature is indicated. There is some variation in spot energy distribution with temperature, but nearly all white-light energy remains within the f/8 Airy disk at 0.555µm. Figure 8 shows that the best system focus shifts away from lens about 3.1mm as the temperature rises from -20ºC to +50ºC, assuming thermal equilibrium at each temperature. Figure 8. Shift in white-light best focus with temperature. The modulation transfer function (MTF) plots shown next in Figure 9 indicate that at each white-light best focus, the lens MTF is essentially unchanged over temperature right out to the limiting resolution of the lens. MTF performance rolls off only very slightly at the -20ºC and +50ºC temperature extremes. Variation in lens RMS wavefront error and Strehl ratio with temperature are shown in Figure 10. As seen in the MTF plots, the RMS wavefront error increases slightly at the temperature extremes, corresponding to the slight roll-off in Strehl ratio. Figure 10. Variation in RMS wavefront error and Strehl with temperature. Using athermalization techniques, and with broadband antireflection coatings, the imagery from this temperature-corrected apochromat would essentially be identical to a 100mm f/8 reflecting telescope mirror with perfect figure, clean mirrors and no central obstruction, with thermally equilibrated optics, and at best focus. 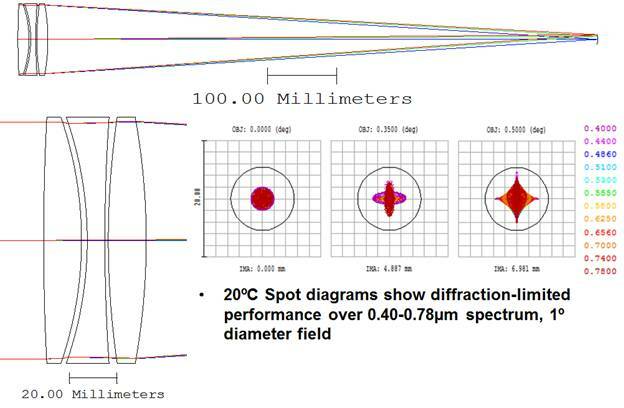 Finally, the spot diagrams in Figure 11 show the improvement in lens performance over temperature when the lens is optimized over a temperature range, rather than just at one temperature. All spots are at white-light best focus. In Figure 11 the upper spots are for the athermalized lens, while the lower spots are the result of optimizing the lens only at 30ºC and not correcting over temperature. The spots at 30ºC are naturally the smallest and most concentrated, but the low-temperature spots have ballooned considerably compared to the athermalized lens. Figure 11. Athermalized vs. non-athermalized lens performance. All-reflective telescopes are, of course, not affected by thermo-optical variations. However, thermal expansion properties of both mirror substrates and structural materials remain critical to robust telescope design. Reflecting systems can be more sensitive to thermal transients than refractive systems, as thermal gradients within the mirror substrates can temporarily alter the aspheric profiles of the mirror surfaces. Thermally-induced changes in the spacing between the mirrors in compound reflectors such as Cassegrains and Gregorians generate spherical aberration in the on-axis image, even with refocusing. Changing temperatures also affect mirror alignment of unobstructed telescopes, as the mounting structure changes shape according to its expansion properties, and mirror elements shift and tilt relative to each other. Use of zero to low-expansion graphite composites for mirror struts and telescope housings helps greatly in reducing the effects of temperature. Athermalization in all-reflective telescopes is a lengthy subject worthy of a separate article, if any readers have the time and interest to write one for Cloudy Nights. Thermal optimization is a necessary part of optical and opto-mechanical design when any refractive or catadioptric optical system is to be stored and operated in a wide range of temperatures. A very sharp lens can be designed at one temperature, but it may or may not perform well when operated at significantly different temperatures, even at best focus. At extreme temperatures there is even risk for fractured or loose lens elements if thermal properties of the lens barrel are not accounted for. A lens intended for outdoor use should be optimized with full knowledge of all thermal variations for all materials employed. These thermal properties must be available and reliable for all materials used to give optimum athermalization. The glasses used in this example lens all had thorough data for CTE and dn/dt available in the Zemax glass library, and the resulting lens would perform very well over temperature if built. This is a great subject and you've done a really nice job with it! Good article that goes beyond the simple, linear models assumed in most thermal-compensation focuser schemes. Nice work done on thermal modeling.